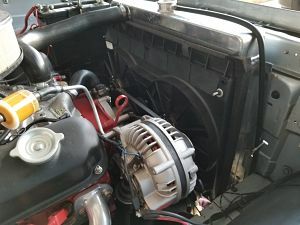 The ‘Cuda is 100% leak free these days….doesn’t drip a drop of anything anywhere – not bad for a classic muscle car that just turned 51 (September 7th)! That last thing I did to her was installed electric fans. It would run fine out on the highway with lots of air rushing through the radiator, but get off the freeway and hit some long traffic lights and the temperature would creep up and up until I didn’t feel comfortable with it. With the new fans – it holds a rock steady 190 degrees all the time now – MUCH happier with that!